So during one of my lunchtime excursions to the local gaming store, I came across this Star Wars X-Wing starter set. Looked interesting enough, minimal assembly, no painting and very basic rules, looked perfect. After doing a bit more research and watching some games played out, I soon realised that this could be a nice little game you can have in about an hour or so and looked simple enough for the kids. Did I mention it was STAR WARS ?! While the official site says the game is for the 14+ age group, if you leave out some of the complexities like upgrades and special abilities, it is something younger aged kids can play. The starter set (as to be expected) comes with everything you need to get started, and with only 3 ships, the play time is short (again great for kids). After the starter set, the first thing you want to do is get another ship or two to make things a bit more interesting. But when you do that, you’re likely to need more dice, so the common recommendation is, given the value for money of the starter set, instead of buying one, get TWO starter sets. A pack of extra dice and one additional expansion ship will cost about the same as another starter set. 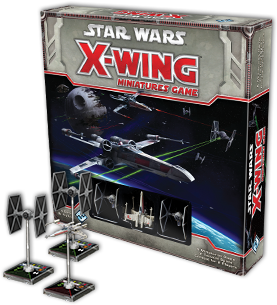 With two starter sets you’ll end up with 4 Tie Fighters and 2 X-Wings, plenty of dice and some spare templates and other bits and pieces. Compared with say Flames of War rule book of a couple hundred pages, the X-Wing rules are covered in about 20 pages. It’s very easy to pick up and start having some fun, and despite the seemingly low specs on the Tie Fighter and X-Wing, with the luck of the dice and movement it’s surprising how much of a tango you end up doing before someone goes down. The movement templates also make for interesting play, initially thinking the templates would make it someone restrictive, they really make sense and as each ship is limited to using only a subset of the templates, this along with the pilot cards give the ships their own unique abilities left up to you to exploit against your opponent. 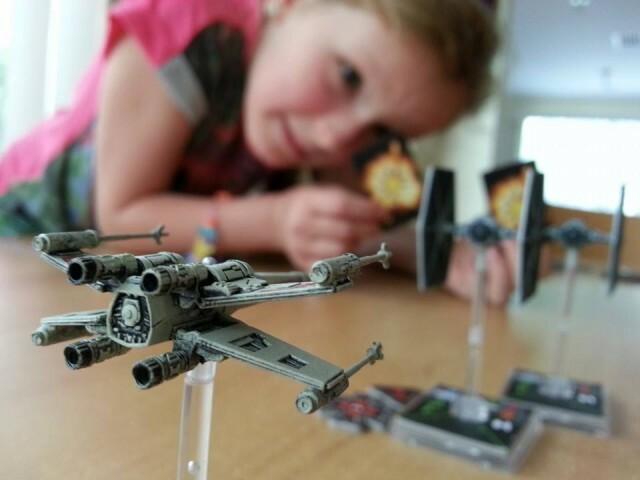 This entry was posted in Gaming, Miniature Wargaming and tagged mini war gaming, Star Wars, X-Wing. Bookmark the permalink.